Greg Amundson learns a tough lesson when his poor command of double-unders costs him a trip to the 2009 CrossFit Games. What happened after that is the real story. At 7 a.m. on the day of the Last Chance Qualifier, my wife Mallee woke me up and said, “Honey, do you know how to double-under?” At that moment, I couldn’t think of the last time I had even held a jump rope in my hands, but I was confident I could perform the skill at a competitive pace. How hard could it be? I was in the best shape of my life and ready for any challenge, but I discovered very quickly that I had absolutely no competence in the skill. 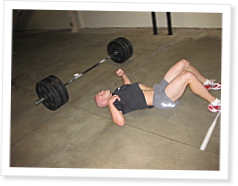 I did the first two Last Chance WODs, and when I got to the deadlift/double-under workout, I ripped through the deadlifts without any problems. I stumbled through the first 10 double-unders in a row before getting tripped up and missing a revolution. Then something amazing happened: I performed 33 double-unders in a row. That was 23 more than I had ever done before. Then all hell broke loose. As I started my attempt for repetition 44, I failed. I tried again and failed. This continued for a painstaking full minute. It got to the point that I was unable to perform even a single accurate jump. It was horrible. Thus began my journey of self-discovery into the skill of the double-under. There are 41 comments on this article. Login to add your own. This is a Zone diet article written from the perspective of an athlete with a full time job. DUs are my nemesis. I have been working them EVERYDAY for at least 3 months, and probably more like 6. I have finally broken down to recording myself to see if I can figure out I am doing wrong. They make me cry, really, cry. Sigh. Greg's improvement in running, box jumps, and shooting, where improvement had previously stalled, is most interesting to me. It shows the complementary nature of Crossfit training. Pullups help skiing; double unders help shooting. As Coach Glassman has said, effective training is a compromise between opposing goals, such as strength and endurance. At the same time, effective training is also about finding movements and workouts in which improvement transfers over to a wide range of seemingly unrelated exercises. Greg's article is a powerful argument for regularly training weak points in a lower-intensity context in addition to heavy lifting, fast running, and blazing metcons. If Greg has benefited so greatly from training one of his few weaknesses, imagine the benefits that athletes with lesser bases in fitness could gain from improving their general physical preparedness. Thanks for doing this Greg. It has helped me work out why I can't, or won't, do them. It is also an inspiration and encouraging for me to see how you approached a weakness and turned it into a strength. This is inspiring. What were the winning times for the last chance qualifiers and how did your other times stack up? Also, I'm no Buddy Lee, but based on the last clip of your G3, it looks like you can trim quite a bit off of your rope. Greg, you are amazingly humble. I don't care really how you make it to the Games, I want to see you compete! I thoroughly enjoy your contributions to the CFJ. Kryptonite is to Superman, what Double Unders WERE to Greg A. Very cool. I love the data to back up Coach's constant talking point about how we have the most to gain from attacking our chinks headlong. I "grew up" in CrossFit watching Greg A on videos. That man has been my inspiration since I began over 4 years ago and continues to inspire me to this day. Great video, Greg. Thanks for sharing all of that with the community. My long-time man-crush in CF was Josh E (okay, still a little bit because he's just that nice a guy). But Greg's 100 mile odyssey and this article have added him to the list. And a 58 sec 400m at 200 lb? Jesus Christ, can you imagine being a perp and having THAT guy chasing you? Greg, your willingness to share this is as inspirational as your efforts. Awesome to see Greg in videos again! You were a huge inspiration to me when I started and this video has added even a bit more fuel to the fire for me. Thanks for the article Greg! I'd gladly soak my feet in ice water and kick a fire hydrant 100 times on national TV to get a breakthrough on the DU. I'm convinced there's a gene that prevents otherwise great CrossFitters from achieving the coordination to perform these. Now, Greg gives me the inspiration to keep the toe to the grindstone. "Finding a weakness is like striking gold." ccrow on Irononline.com forum. Much like finding this golden inspiration of an article. THX. Greg, the first CrossFit video I ever saw was one of you epic Fran battles with Josh, and you have since been a tremendous inspiration to me. CrossFit has benefited my life in so many ways, seemingly unrelated, much as your comparisons on ho DU improved many other facets of your life, as many others can surely attest to. Congrats Greg, you are a prime specimen and personification of what CrossFit does. Great article! CrossFit does expose chinks and shows that one person may develop a skill quicker than another, but develop another skill much slower than that same person. For me, I picked up DU's pretty quickly, I do not lose my coordination when fatigued and I can get through them lightning fast. HSPU's on the other hand have been very difficult for me (four-five months ago I was having trouble going vertical). They are finally starting to come around. Greg, what a great example of putting in hard work and determination to work on a skill. It is amazing how quickly you developed DU's, especially when they looked as bad as they did in the initial WOD. Thank you very much Greg! The article was amazing. I'm so impressed and humbled that you would not go to the games unless you qualified like everyone else. CrossFit is lucky to have you. Thanks! I did GI Jane at a local high school after watching the video thinking "well if he can do 100, I'll shoot for 50. When I got to 50 I thought "I can get to 60"
When I got to 70 I knew I could finish and so I did - 23:20 then I almost broke down sobbing because I did what I thought I could not do and surely never would have attempted if not for seeing that video. I'm sure others have similar stories about how all those countless videos of Greg. I watch many of them on a regular basis before starting the WOD. By the way, I did GI Jane last week in 19:16...with 100 chest to bar pullups and 100 chest to deck burpees. Loved the article and the videos. Thanks for sharing. But where is the video of Greg´s last workout? My wife has a jump rope somewhere. Now I've got to go find the thing. . . . The video is the last word of p5. The videos are in .mov (QuickTime movie) format. If they aren't playing, try getting the latest version of the free player here http://www.apple.com/quicktime/download/. Great stuff Greg, you have always been my favorite Crossfit "celebrity". Also, your "tupperware man" article was very helpful in me diving into the zone with Paleo'ish foods without over-thinking it since I'm also 6'0" and 200 lbs. Since Greg did attempts 3 and 4 a couple of weeks after the first two workouts, this number crunching is purely just for fun and something that I'm sure that Greg has already figured out a long time ago. Inspiring and humbling. I respect you and your approach to yourself and your fitness more than I can say. Highest props! What a great story of finding an opportunity in discovering a weakness. So many times I find myself avoiding something because I don't want to find out how much of a weakness it actually is. This helps to show how much attacking those elements can improve your performance in ways you couldn't even have imagined. Awesome. You and OPT were my first 'introductions' to CrossFit and I found great admiration and determination in both your efforts. Since then, I have become the Co-Owner of two CrossFit's in South Jersey. Thank you for your continued effort in being a well-rounded athlete and individual, it helps me strive for the same. I wish you all the best and know you'll qualify next year!! Tony - any idea on where next year's filfest will be held? Way to go Greg. DU's are one of my weakness. Now I will have to go out and spank them. I had asked Greg at the qualifiers if he was going to the games. He told me his competing days were over. I guess the bug set in. Can't wait to see how he performs next year with the new found passion for constantly varied. Great article Greg. Your old videos inspired me to follow Crossfit. I remember thinking, "hey, this guys got muscles AND he's crazy conditioned". I don't think anyone matches the tenacity you show in your workouts. Thanks for the integrity you bring to Crossfit and thanks for continuing to inspire us. Greg, I was wondering where you been! Excellent article. I appreciate your humility. The old school gang at Diablo CrossFit knows you and your performances very well. We hope to see more of you around here and at the Games! I think the NorCal qualifiers are relieved you missed that event! Maybe my improvements in DUs over the last couple of years have made me faster too. Or it could be a combination of DUs, Oly lifts, and technique work. In any case, I'm faster than ever, including in the mile. The magical 2-minute barrier for straight DUs remains elusive, though. Now somebody post a video of consecutive triple-unders by a 200-pounder. I know I'm a little late on this comment, but I haven't been staying in tune all that much with the Journal since my move on over to Japan. I loved the article. It absolutely crushed me when you hit a wall on the doubleunders during the first attempt. I wanted you to succeed so bad, but I'm glad to see that you have vastly improved and this is an inspiration for me to work on my doubleunders as well. It was an honor to help you out with filming and I hope to see you and Mallee again sometime soon! Take care my friend! Wow! Great attitude, character, motivation, role model ... true metal. Wow! I did my first few DU's yesterday... Now I must do more! An absolutely wonderful example of the value of variety as a component of the CrossFit methodology. The fact that you improved in so many skills including shooting accuracy is further proof. Your tenacity and desire to improve as an athlete are to be emulated. Great work.